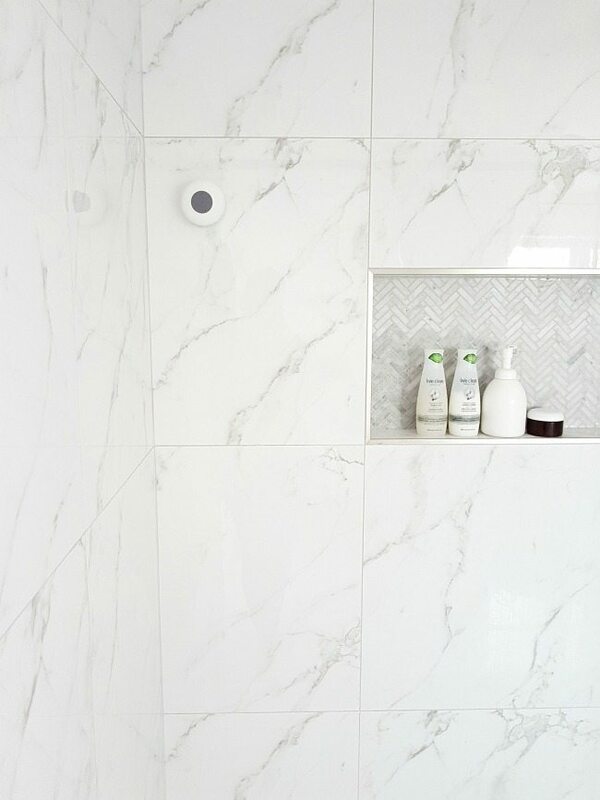 The one thing that held up our bathroom renovation the longest was our new marble shower. 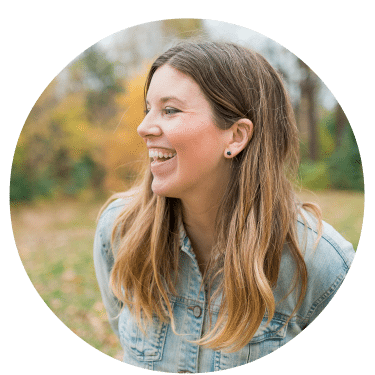 I hummed and hawed for a long time on what tile to use, and then when I finally landed on some, had to wait quite a while to get into our contractor’s schedule. But the shower is now done, and I couldn’t be happier with how it turned out. 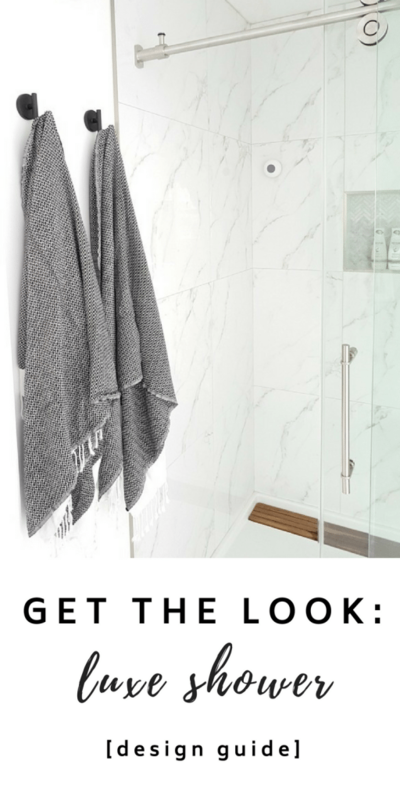 Cue the luxe, hotel-like shower…. We used a medium gray grout (“Silverado”), which doesn’t distract from the tile but also won’t discolor like white grout does. 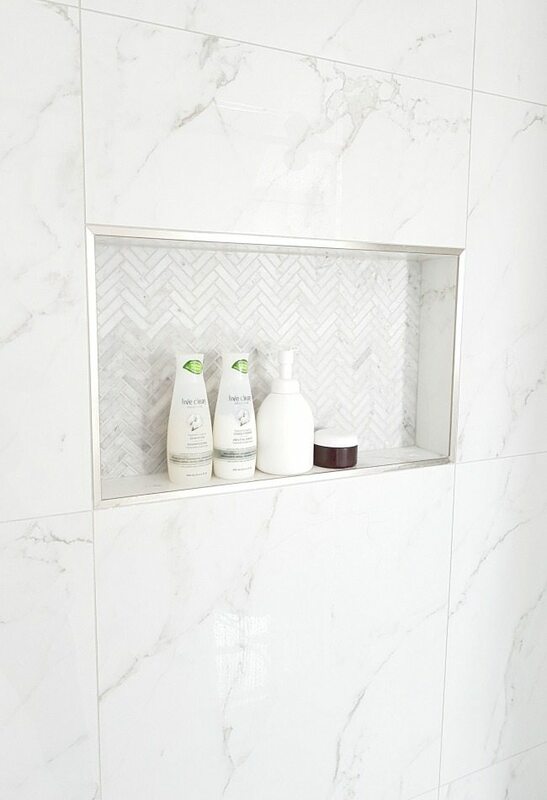 I wanted to do something a little fun in the niche, so I grabbed some small herringbone marble tile which comes in 12×12 sheets (we used this one from our local Lowe’s). If you wanted to price compare, there are actually a bunch for sale on Amazon with great reviews! Going for something cheaper on the walls but more expensive in the niche is a great way to stay on budget, but still look super fancy. We used Schluter edging for the niche from Home Depot. 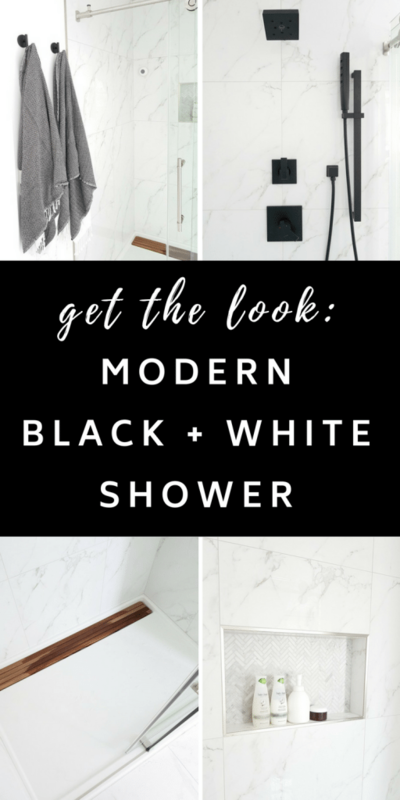 Although we don’t use many bath products these days, since we have gone toxic-free everywhere in our home (in there I have unscented Live Clean shampoo and conditioner, my own homemade body wash and sugar scrub), we still did a large niche to look in keeping with the big shower. And the jewel of the shower? Our matte black faucet system by Delta. It’s the Ara collection… and seriously, so stunning. I’m obsessed with it. 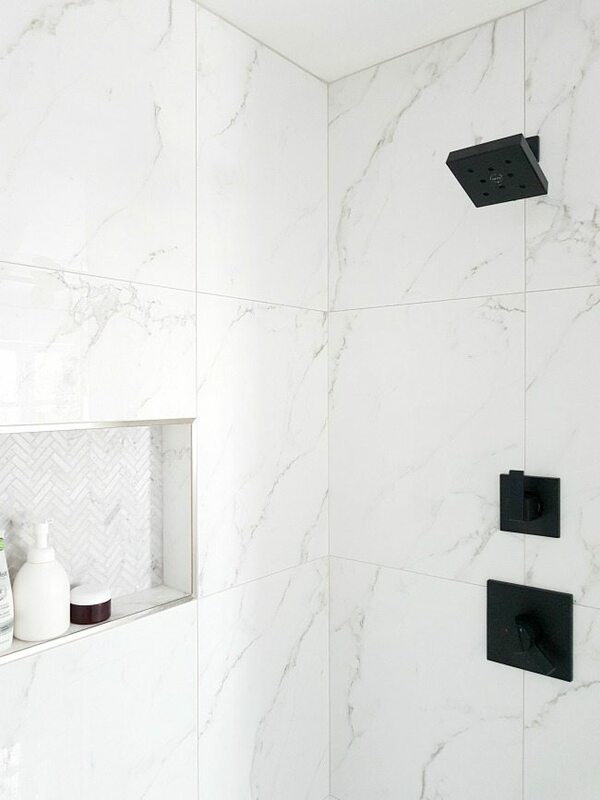 Not only does it look sleek and amazing (totally pops against the big marble tiles), but it works like a dream. The pressure is perfect, the hand shower has different spray options, and it’s basically heaven. Seriously, Dan and I fight over who gets to shower first and both linger in there for way longer than is necessary. It’s been like living in a hotel!! 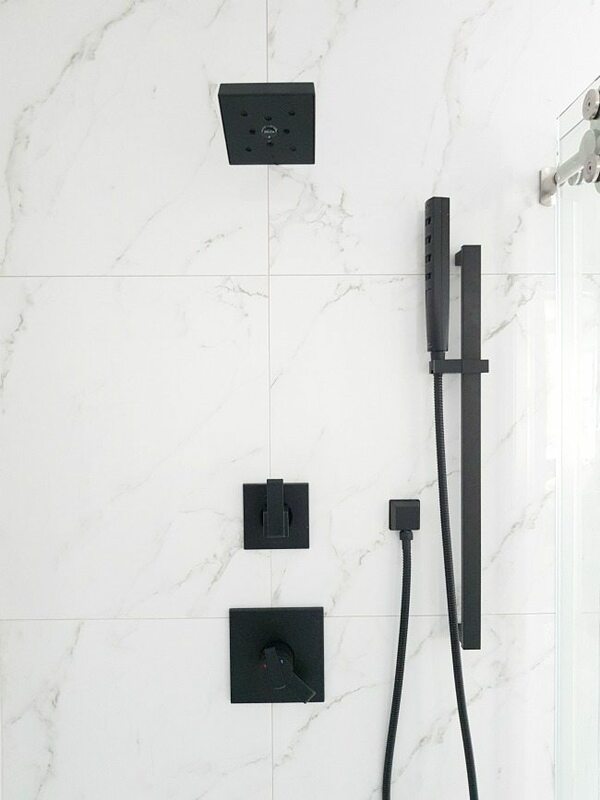 The matte black looks nice in combination with the other chrome details in the room (shower door track, etc), and we kept the Delta Ara collection going throughout the room with those hooks, vanity faucets, and towel bars. Instead of a tiled shower floor, we used a shower pan by Kohler. 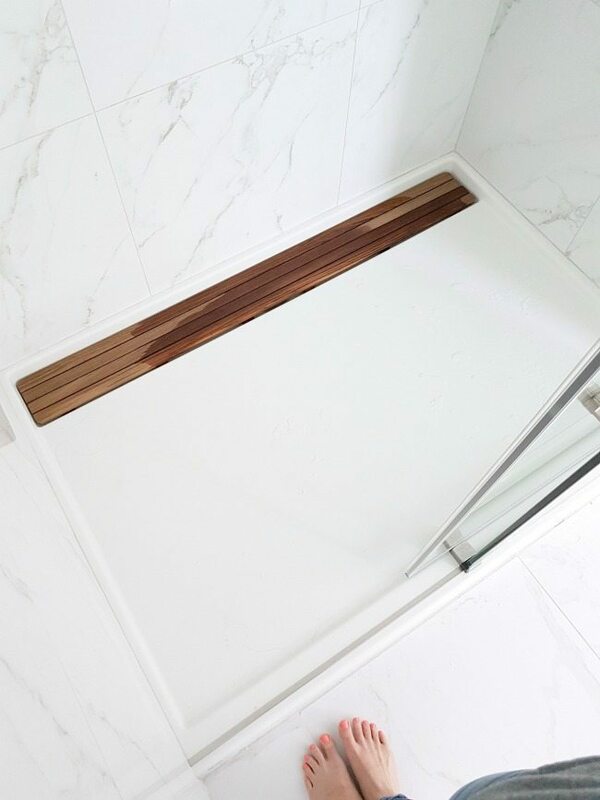 The wood plank is this teak drain cover by Kohler. We purchased both items on Amazon, which felt a little nerve-wracking (site unseen with big ticket items always makes me a little nervous!) but they worked out perfectly. 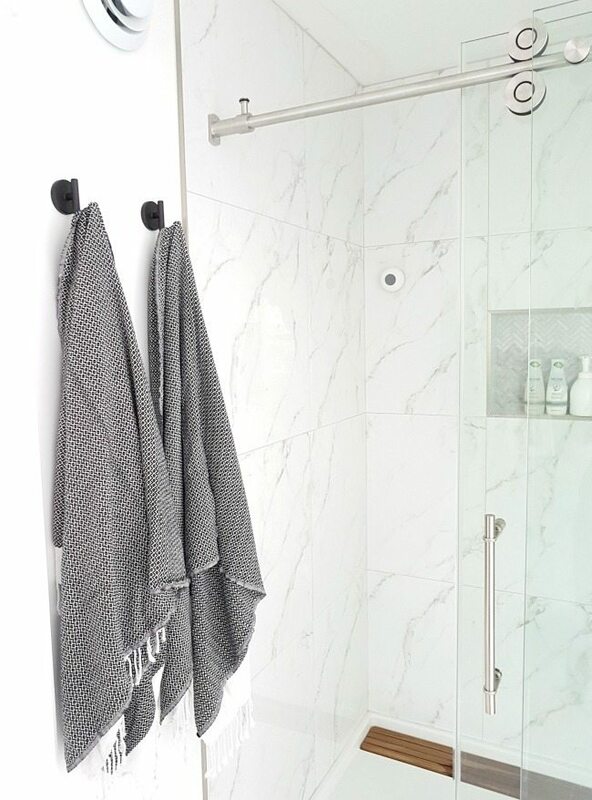 It’s by Fleurco, who are some of the industry leaders in shower doors. I have to be honest, this was a bit of a fluke. 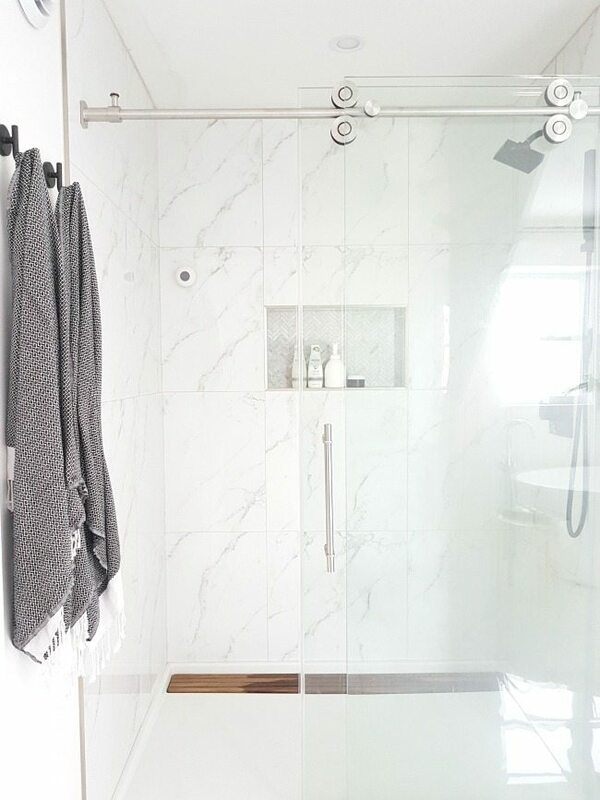 We probably would’ve gone with something more budget friendly, but our neighbours had purchased this shower door but it didn’t fit in their space. Returning it was going to cost them money, so they wanted to just sell it locally for $1000. We hopped on that deal insanely fast, since the original price was over $2k and we knew it was a quality door. 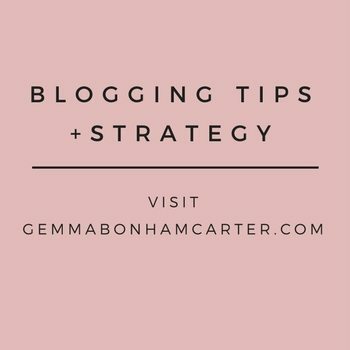 So there is a perfect example of how to get a designer, luxe look but while still getting all the products from big box stores. 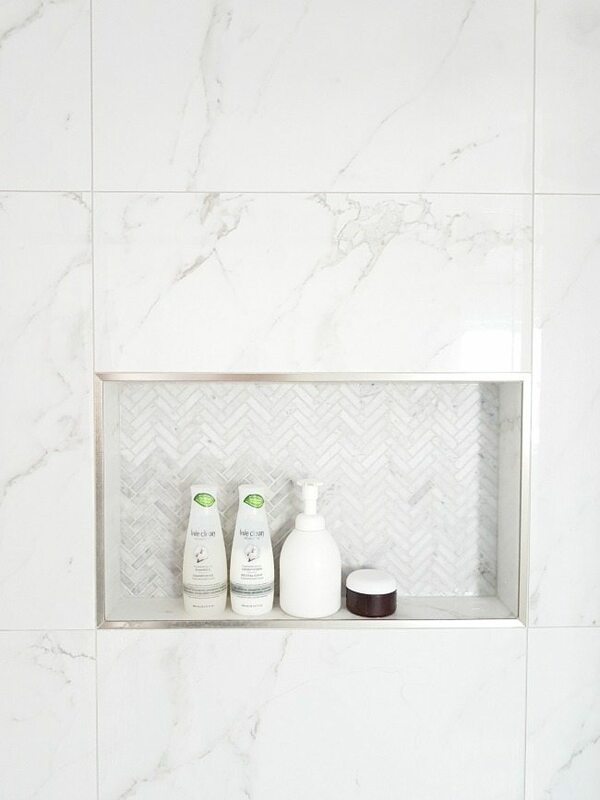 Save on the big stuff (like getting clearance tile), but then add ‘jewellery’ with the gorgeous Delta faucets and accessories and specialty tile in the niche. Thank you to Delta for sponsoring this post. If you are looking for any faucets and fixtures for your own home, you cannot get better quality and style than Delta. They are my fave! What size is the shower?